The Kansas-Nebraska Act of May 30, 1854 created the territories of Nebraska and Kansas, which had to be surveyed before settlement could proceed. In November 1854, Captain Thomas J. Lee of the U.S. Army Topographic Engineers determined the Fortieth Degree of North Latitude along the Missouri River. On May 8, 1855, the cast iron monument on the bluff above was erected by Charles A. Manners to mark the beginning of the base line (Fortieth Parallel) forming the Nebraska - Kansas boundary. In 1855-56 Manners surveyed westward from the cast iron monument along the base line 108 miles to establish the Initial Point of the Sixth Principal Meridian. The Initial Point controls the system of section, townships, and ranges of the public land surveys in Nebraska, Kansas, and parts of Colorado, Wyoming, and South Dakota. 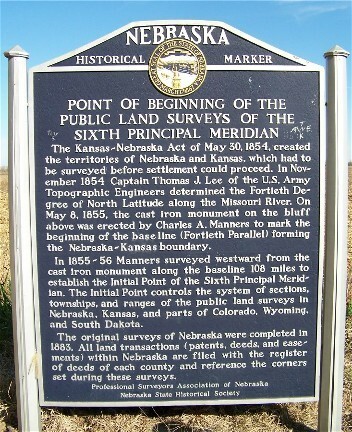 The original surveys of Nebraska were completed in 1883. All land transactions (patents, deeds, and easements) within Nebraska are filed with the register of deeds of each county and reference the corners set during these surveys. 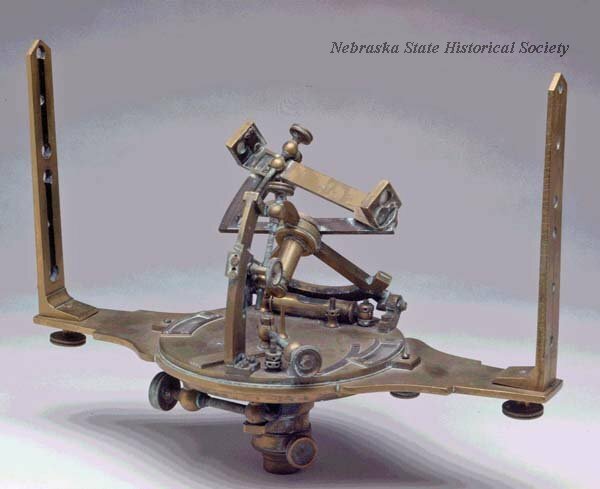 “Point of Beginning, Public Land Surveys of Sixth Principal Meridian,” Explore Nebraska History, accessed April 19, 2019, https://mynehistory.com/items/show/433.